Though Nicholae Ceaușescu believed himself to be beloved by Romanians, calling himself “Conducator” (Leader) and “Geniul din Carpati” (either Genius or Giant of the Carpathians), the austerity measures he put in place to repay the country’s debts as he began an unnecessary systemization program starved his people while Communist officials showed signs of public wealth. Ceaușescu, a man who had only graduated four elementary classes in his lifetime, fought a stammer all his life, and had never read Marx or Lenin, seemed to be an unlikely candidate for Party leadership. He was lower class, the son of an abusive drunk from a rural area of Romania. He was incarcerated in his youth for distributing Communist leaflets against Romania’s current fascist government. While in prison, other Communists mentored him, though they worried that he misunderstood the works of Stalin. He was released in 1939 but was quickly imprisoned again as one of Romania’s 800 known Communists, by the orders of Antonescu (who was an ally of Hitler’s) where he met the men who would go on to found Romania’s Communist party after it was made a Communist state at the end of World War II. When the current party leader died of cancer, Ceauşescu promised various party leaders that he would be the perfect puppet president, inexperienced and therefore malleable. But once installed in power, he went his own way, sometimes refusing to join Russia in policy decisions, including opposing the invasion of Czechoslovakia in 1968. This gave him an identity as “Communism with a human face,” and even his opponents applauded his decision. 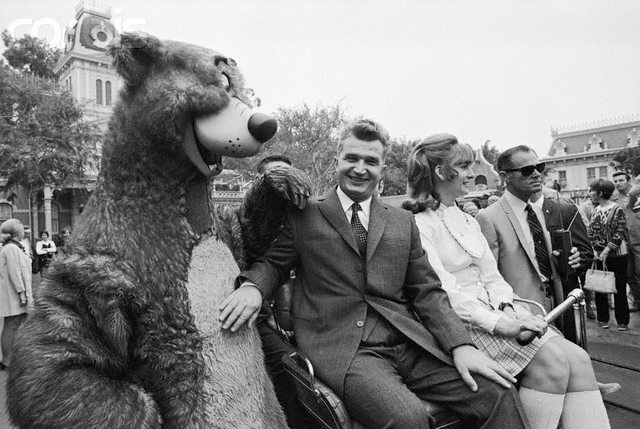 Then President Nixon visited Romania in 1970, and Ceauşescu visited the United States, even making an appearance at Disneyland where Mickey presented him with a t-shirt and a kiss. The following year he visited China and North Korea, admiring China’s cultural revolution and North Korea’s Juche inspired rapid industrialization. This would put Romania on a track to popular poverty and crippling austerity, see Systemization for more info. The Ceauşescus cultivated a cult of personality around themselves to help them stay in power. Part of this was their biographies being taught in schools (as we see Flavia doing.) The other part was the production of propaganda films and art that supported the regime. For example, look at this poem by noted Party supporter and writer Corneliu Vadim Tudor in 1984. Clad in the Romanian fashion. Coming with a science brain. As a side note, Tudor is still around denying the Holocaust and abuses of power by the Securitate under the Communist regime. I am not going to link to the video of his and Elena’s execution here but it’s easily found through a search engine.